Web and mobile app designers are well aware of designing for microinteractions – those small, finely detailed moments of interaction between a user and your website. 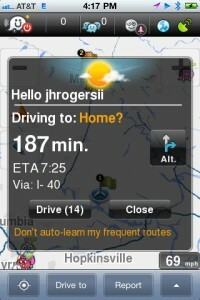 Take for example Waze, a social GPS app for smartphones that has a strong following and was recently purchased by Google. Waze does a fantastic job of learning a user’s behaviors and thereby offering a customized experience. If you leave work at the same time every day to head home, Waze automatically learns your route and schedule and will prompt the way. Another obvious example that Dan Saffer shares in his book Microinteractions is the button that silences the ring tone on your mobile phone. On the iPhone, this is the top button on the right. This finely detailed function is also considered a microinteraction. I know all too well the power of this specific micointeraction. Two years ago during my wedding ceremony, my husband’s best man’s cell phone went off loudly during our vows. We politely ignored the call and then – alas – the caller decided to try once again! Loud rings droned on as my brother-in-law shuffled with his phone, not knowing how to turn off the ringer. To the annoyances of all involved, my husband finally grabbed my brother-in-law’s phone and threw it into the bushes behind us. Much laughing ensued, the wedding carried on, and the caterers kindly retrieved the phone after the ceremony wrapped up. The lesson here? Never underestimate the importance of small functionality! But how are associations designing for these types of microinteractions on their websites? How are organizations soliciting feedback from volunteers? There was a great #assnchat Twitter chat on engaging volunteers recently during which the topic of introverts, extroverts, and lurkers came up. There was much debate on ways to “love the lurker” and push him to become more involved. In this chat, I used Facebook’s “Like” button as an example of soliciting feedback from your lurkers – which also happens to be another great example of an important microinteraction. Not every member/visitor will comment on your post or write a review of your product, but allowing the visitor to quickly provide feedback by “liking” or giving a star rating of your content is a step in that direction. Suddenly, your lurker is no longer just “lurking” and has completed an action. How is your association designing for these microinteractions? How are you customizing the user experience based on the data you have? Have you designed functional details for your members’ delight? Looking for more information? Chekout our whitepaper, How Mobile Ready is Your Organization? Scrabble, anyone? From association acronyms to professional certifications, Kylee's got the winning letters. Holding a PMP and CSM, she has a way with CRMs, CMSes, and so much more!